"A very easy stew. One of the first recipes my mother taught me when I was a teenager." 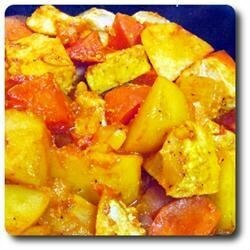 In a large pot, put the chopped onion, chicken breast meat, carrots and potatoes. Add the salt and turmeric. Dissolve the tomato paste in water and add. If desired, add garlic powder and ground black pepper to season. Cook for 1 to 1 1/2 hours on medium low heat. Serve. My husband claimed this was the nicest thing I've ever made! It was really yummy-I normally don't eat vegetables-but I loved this! Our friends served this stew to us last night and it was delicious - I couldn't believe how easy she said it was to prepare - so I looked up the recipe and have saved it to my favorites! I am sorry but this was just a basic chicken stew. Good in all rights but no pizazz.